Besides being Pearl Harbor Day and Noam Chomsky Day, December 7 is a black-letter anniversary for capital punishment as the date in 1982 when the United States first executed a prisoner by means of lethal injection. Charles Brooks, Jr. — who had by the time of his death converted to Islam and started going by Shareef Ahmad Abdul-Rahim — suffered the punishment in Texas for abducting and murdering a car lot mechanic. With an accomplice,* he had feigned interest in a test drive in order to steal the car, stuffing the mechanic in the trunk and then shooting him dead in a hotel room. The “modern” U.S. death penalty era had just dawned with 1976’s Gregg v. Georgia decision affirming new procedures meant to reduce systemic arbitrariness — and the machinery was reawakening after a decade’s abeyance. In the wake of the circus atmosphere surrounding the January 1977 firing squad execution of Gary Gilmore, the laboratories of democracy started casting about for killing technologies that were a little bit less … appalling. This was not actually a new idea: proposals for a medicalized execution process had been floated as far back as the 1880s, when New York instead opted for a more Frankenstein vibe by inventing the electric chair. And the Third Reich ran a wholesale euthanasia program based on lethal injections. Texas was one early adopter, rolling in the gurney to displace its half-century-old electric chair. Its debut with Charlie Brooks was also Texas’s debut on the modern execution scene, and both novelties have had a lot of staying power since: every one of Texas’s many executions in the years since — 557 executions over 36 years as of this writing — has employed lethal injection. 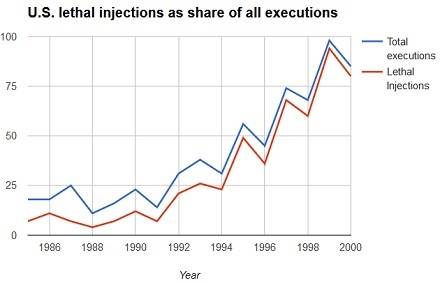 * For up-to-date figures, check the Death Penalty Information Center’s executions database. First published in 1577, this document — heavily mined by Shakespeare for his histories — is silent as to the further particulars of the beheading. 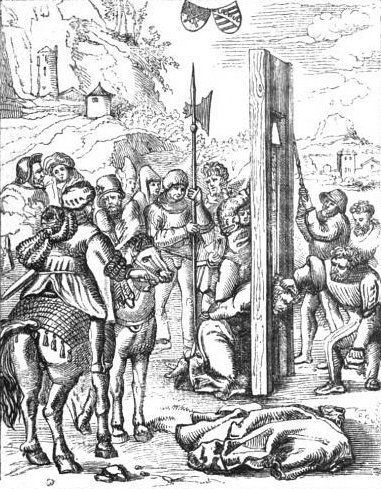 But the accompanying image depicting the execution surprisingly presents a guillotine-like device being employed for the task. 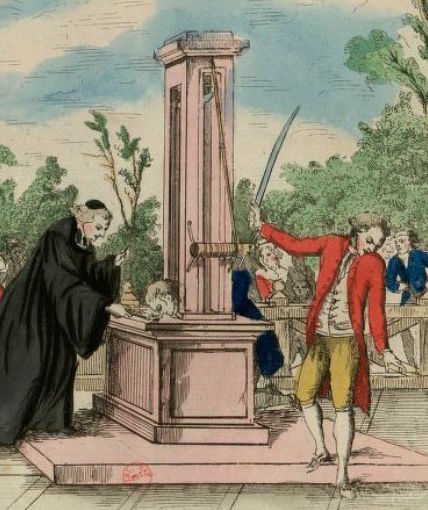 As John Wilson Croker’s History of the Guillotine observes, this one illustration 270 years after the fact scarcely suffices to establish that a guillotine precursor really was in use in Ireland in the first years of the 14th century. 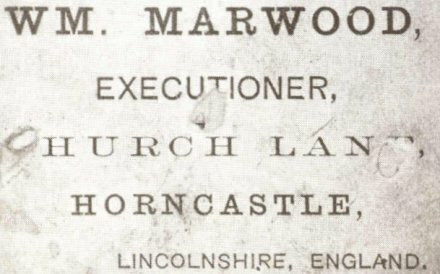 Were that the case, this might be the earliest quote-unquote “documented” execution by a beheading-machine. 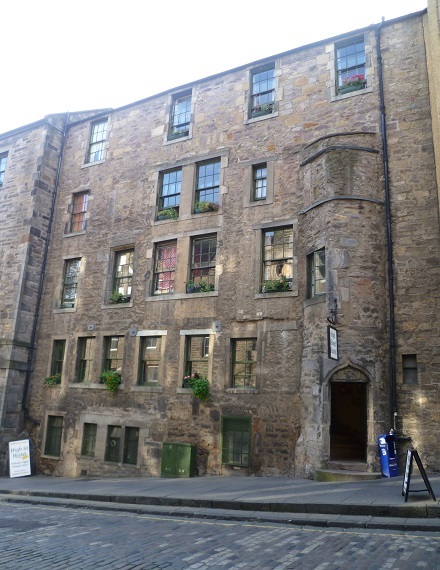 But it does at least establish the authors’ awareness of such technology — perhaps by familiarity with the Scottish Maiden, or perhaps by having caught wind of similar gadgets in France and Italy. 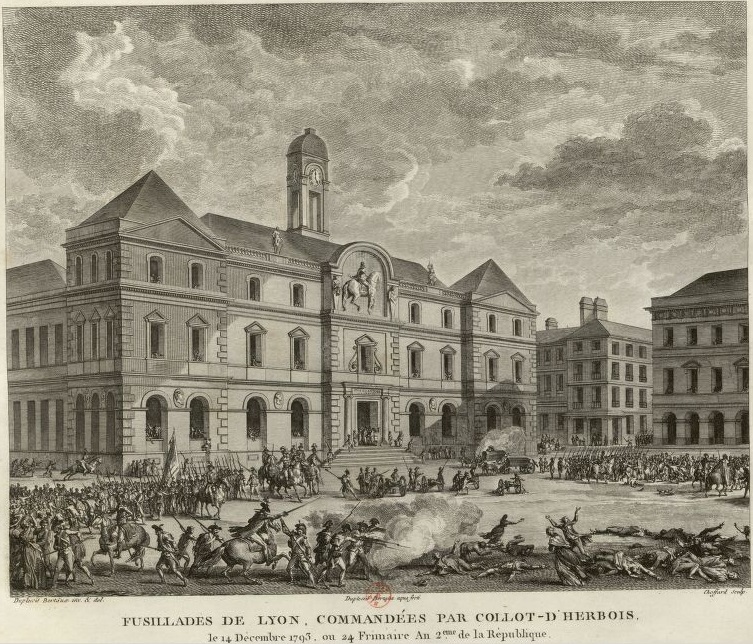 The executions on December 14, 1793 illustrated above (image from here) date to Revolutionary France’s violent suppression that month of the France’s second city for its resistance to Jacobin power. 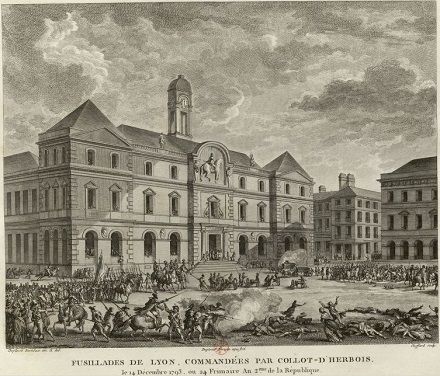 We have alluded before to this bloody interim, led by the National Convention‘s ruthless emissaries Collot d’Herbois and Joseph Fouche — two men well aware that any appearance of undue leniency in the chastisement of Lyons might send their own heads under the guillotine back in Paris. Now, grapeshot is an outstanding weapon in the right spot, but it is not at all certain to kill its targets. On the battlefield, mangled survivors were just about as good as dead bodies when it came to mauling the soldiery. But executioners usually aim for something a bit more predictably lethal. The mitraillades could not offer anything close to dependable, near-universal slaughter … and so the horror of the artillery discharge was followed (as one sees in the drawing above) by the horror of the many stunned and injured survivors of the cannonade being finished one by one at close quarters with muskets and bayonets. Though a single coup de grace might count as a mercy, a hundred at once made for simple butchery. The mitraillade did such brutal work that the national government soon ordered its Lyons deputation to lay off the innovation and return to the standard device for a Republican execution — the guillotine. * Present-day Francophones will most likely associate the word mitrailleuse with the machine gun. That term dates to a a 19th century “volley gun” capable of spitting out 25 rounds from a cluster of rifle barrel activated by a single crank; for obvious reasons, this weapon inherited its name from the French word for grapeshot, mitraillade. 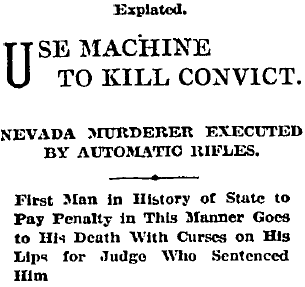 101 years ago today, a Serbian immigrant was shot for murder in Carson City, Nevada. It was an ordinary murder, by an ordinary man: his cousin died in a mining fire in 1911, and Andriza (or Andrija) Mircovich, feeling he got stiffed on the resulting inheritance, stabbed to death the probate attorney (a fellow South Slav named Gregorovich). The execution, however, was extraordinary — and has never in history been repeated. The march of science had lately made possible whole new methods of execution heretofore uncontemplated — like electricity and poison gas. At the same time, mechanical engineering had improved old standbys like beheading and hanging from slipshod, error-prone affairs to efficient operations worthy of an age of industry. Somewhere between those categories lies the firing squad. Firearms, of course, were new technology relative to the noose and a big ol’ axe, but we do find executions by shooting back to the 17th century at least. 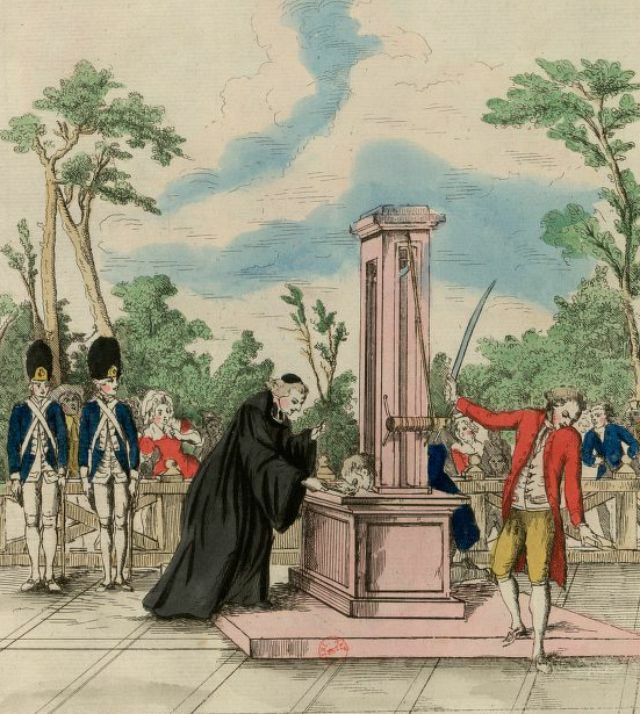 Though the guns themselves had been updated, Nevada was forced by circumstances to do for firing squads what Dr. Guillotin had done for headsmen. Nevada law at the time allowed inmates to choose between hanging and shooting. The state had all the accoutrement for the former, but it hadn’t ever conducted one of the latter. When Mircovich insisted on being shot, and prison officials couldn’t find people willing to pull the trigger, Nevada actually built a “shooting gallery of steel” — an entire contraption to automate the lethal fusillade. Image from this history of Nevada capital punishment. 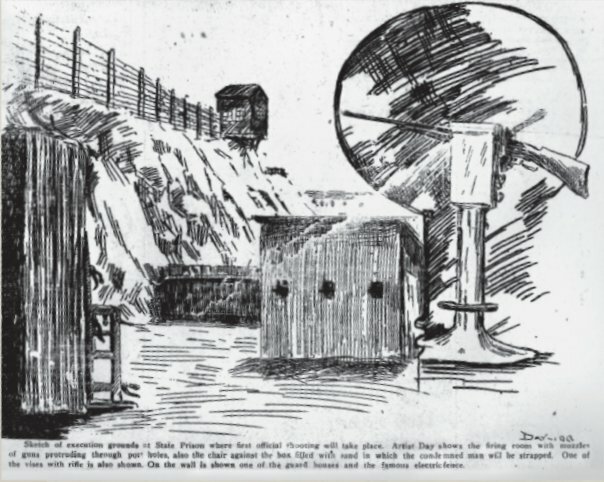 The 1,000-pound gallery of steel, whose arrival caused the prison warden George Cowing to resign in horror,* consisted of a shed with three protruding mounted rifles, which would be individually sighted on the heart of the restrained prisoner and fired when guards cut a string to release a spring mechanism. In a macabre Rube Goldberg parody, it was improved for the consciences of the guards by having three strings that would be simultaneously cut, only one of which actually triggered the gallery. A redundant layer of plausible deniability was added, since each of the three guards had aimed only one of the three rifles, by loading only two of the three guns with live ammunition. Mircovich went to his death still fulminating profanely against the judge who condemned him and the injustice of it all. The scene, it must be said, was not exactly the finest hour in penal history. But the device itself? It worked perfectly, killing Mircovich nigh-instantly with two balls straight to his heart. From the Los Angeles Times, May 15, 1913. Nevada got rid of this inconvenient execution option not long after, and Mircovich remains the only human being put to death by shooting (whether by human hands or mechanical ones) in the Silver State’s history. The guns from this weird artifact currently reside at the Nevada State Museum, Carson City; the scaffolding that once surrounded them is in some aircraft carrier or tank, having been donated as scrap metal during World War II. * Cowing was replaced by former governor Denver Dickerson, who would later oversee Nevada’s pathbreaking gas chamber debut. Digression: Dickerson’s turn as governor had been notable for his arranging a boxing match in Reno between the black champion Jack Johnson and the “great white hope” James Jeffries, which resulted in a legendary Johnson victory and — another sign of the era’s dismal condition of race relations — a nationwide wave of racial violence. According to Unforgivable Blackness: The Rise and Fall of Jack Johnson, Dickerson was the kind of guy who could see past skin color well enough to make bank wagering on Johnson. HARTFORD, Conn., Dec. 18. 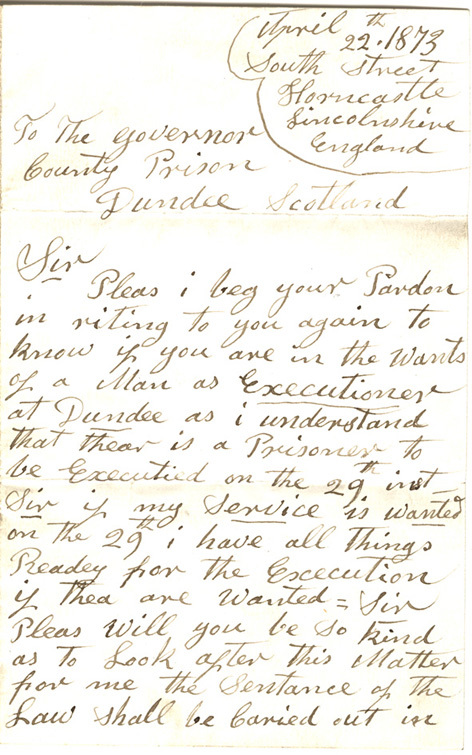 — John Cronin was hanged here at 1:00 o’clock this morning. 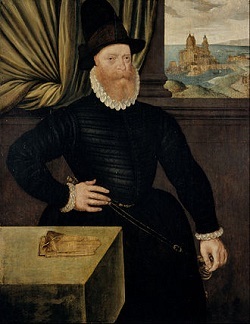 The execution of Cronin was especially interesting, being the first hanging in this state under the law passed by the last general assembly and the first trial of an automatic gallows in the east. This last is the idea of Warden Woodbridge. 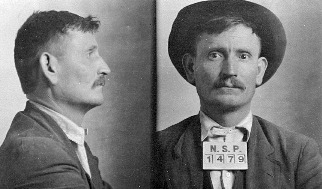 Aided by James H. Rabbett, a forger, now serving a two and one-half years’ sentence, the warden evolved what he considers an improvement on the hanging machine in use in Colorado. Small shot has been substituted for water in the operation of the lever which releases the weight and an arrangement made whereby the execution may be stayed at any moment. 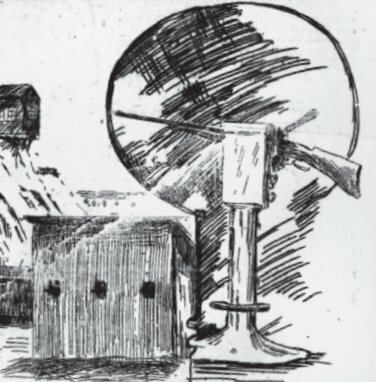 The compartment in which the shot are confined resembles an hour glass and the mechanism is thoroughly under the warden’s control. The shot was started in motion by the movement of a lever, and another lever would have enabled the warden to have stopped it at any time. The progress of the shot and the approaching moment when the weight would be released is indicated on a dial resembling a clock. 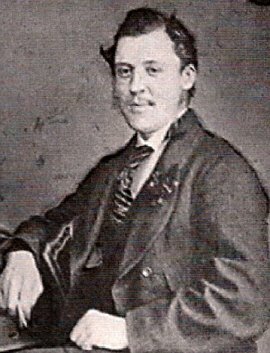 When Cronin had been seated in the chair and made fast, a signal from the executioner indicated to the man who had charge of the lever that he was ready. The machinery was then set in motion, there being no visible evidence of anything unusual. The adjustment of the machine was made so perfect that the weight of 306 pounds made no perceptible noise as it was released and fell back to the ground beneath. 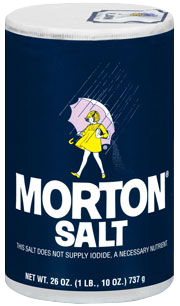 Instantaneously the victim was jerked into the air, falling backward to within 2 feet of the floor. One of the principal improvements over the Colorado appliance is the fact that the prisoner is not his own executioner. With the original machine,* when the prisoner was placed on the chair it released a lever which started the mechanism and in this way the man was practically forced to commit suicide. John Cronin’s crime was the murder of Albert Skinner, at South Windsor, October 6, 1893. He was prompted by revenge for some fancied grievance. He had been boarding with Skinner for several months, but finally was ordered away. 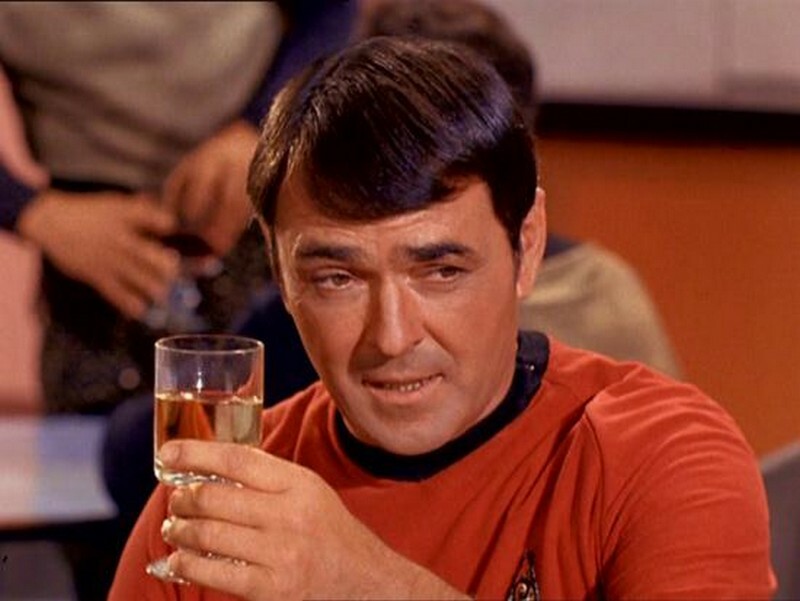 A fight ensued at the time and Cronin then went on a protracted debauch. The morning of the murder he went to Skinner’s house and meeting Skinner in the yard immediately shot him, inflicting a fatal wound. * Developed to hang Dr. T. Thatcher Graves but to my knowledge never actually used. Edison hired Harold P. Brown to help him in his campaign to prove AC’s dangerousness: which brings us to this day’s event, as described in Craig Brandon’s detailed book The Electric Chair: An Unnatural American History. Satisfied that they were ready to go public, Brown scheduled a demonstration at Columbia on July 30, inviting electricians, scientists and the press to watch. 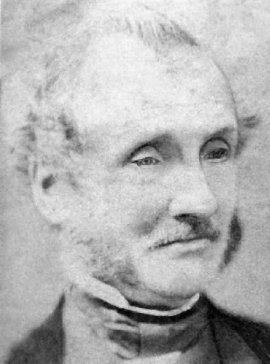 Kennelly and Dr. Frederick Peterson, a member of the Medico-Legal Society of New York, assisted him. 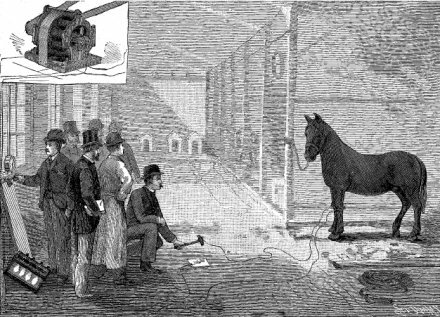 Brown opened his demonstration by insisting that he had been drawn into the controversy not out of any self-interest but because of his concern that alternating current was too dangerous to be used on city streets. He denied charges that he was in the pay of any electric light company and had “no financial or commercial interest” in the results of his experiments. Of course, the fact that he was using Edison’s equipment and was assisted by Edison’s chief of research spoke of itself. Brown then brought in the first experimental subject: a 76-pound Newfoundland dog in a metal cage. The dog had been muzzled and had electrodes attached to one foreleg and one hind leg. SERIOUSLY?! (cc) image from DanDee Shots. 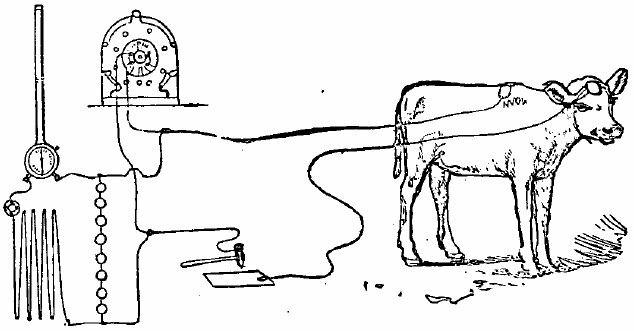 Brown connected the dog to the DC generator that Edison had loaned him and starting with 300 volts gradually increased the voltage to 1,000 volts. As the voltage increased, the observers noted, the dog’s yelping increased but it remained alive. Brown turned the voltage to 330, and the dog collapsed and died instantly. The viewers were impressed, but Brown wasn’t done yet and brought in another dog. He said he was going to connect this one to the AC generator first. This, he said, would prove that the animal didn’t die because the shocks from the DC generator had weakened it. Before he could accomplish this, however, an agent from the American Society for the Prevention of Cruelty to Animals arrived and asked Brown to stop the experiment and spare the poor dog’s life. 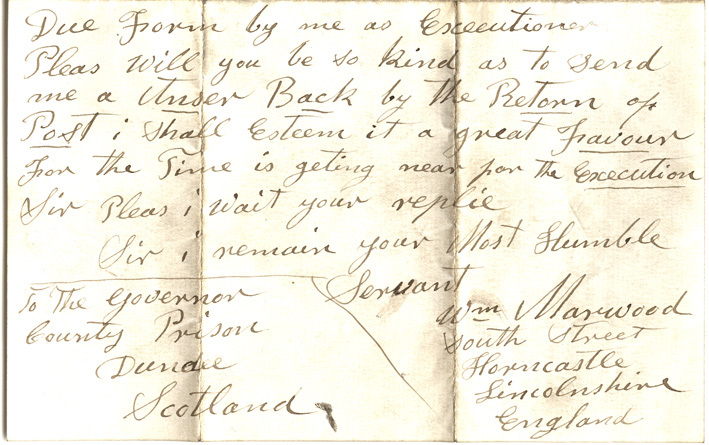 It took some convincing, but in the end Brown agreed to stay of execution. The second dog would die another day. The dog, O where was he? Although the ASPCA might have brought his first experiment to a premature end, Brown was not deterred. He toured New York State for months, giving dog and pony shows before fascinated crowds, where he would electrocute cats, cows, calves, and well, dogs and ponies, using both direct and alternating currents. He paid young boys twenty-five cents apiece to round up stray animals to get fried. The public watched — but wasn’t fooled, and continued to use alternating currents. Even the 1890 execution of William Kemmler in New York’s brand-spanking new AC electric chair failed to convince anyone that they were going to drop dead if they installed AC electricity in their homes. (Brown helped design the chair.) AC won the War of Currents hands-down. 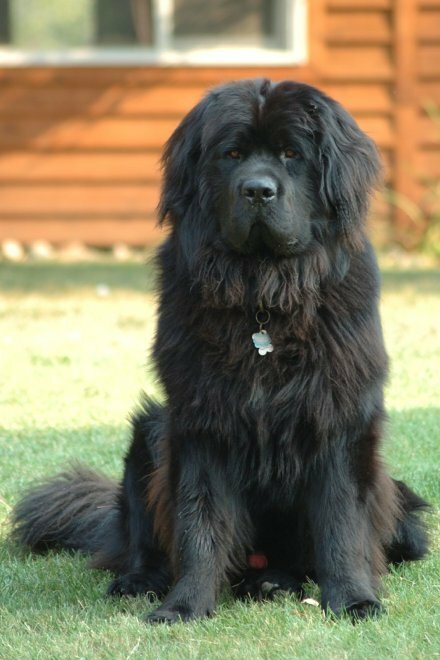 The poor Newfoundland, having laid down its small life for the greater prosperity of Edison’s investors, died, unmourned, in vain. As noted, the thorough Brown put said apparatus to use on a variety of fauna. 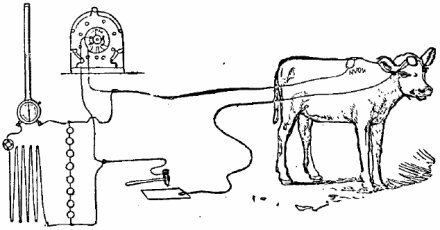 In the interest of science, he also includes in this same article diagrams on the electrocution of a calf and a horse; we enclose them here for your edification.